Code compliant, 60" diameter spiral stair that is three stories high. Spiral staircase handrail # 200 - 1 1/2" round 16 gauge tubing; main and center balusters, # 302 - 1" square 16 gauge tubing are spaced less than 4" apart to be code compliant on this spiral staircase. Spiral stair treads are # 133 - radial grate with a 30 degree run at the widest point, treads are made out of 3/16" A-36 grade steel material, and the center column on this spiral stair is made from 3 1/2" I.D. schedule 40 round pipe. The spiral staircase has a factory finish of hot dip galvanization. This spiral stair was built in three sections for easy shipping and was bolted back together at the job site. 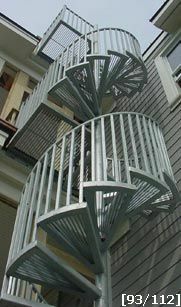 Stairways, Inc.'s welded spiral stairs can stack on top of each other. Height or numbers of sections have no limits. Contact Stairways, Inc. prior to construction with floor heights and floor plans. With this information our staff can help in the design of your multi-level spiral stair.